Invented by the natives of North America, pemmican was used by Indian scouts as well as early western explorers. These people spent a great deal of time on the go and depended on having portable, high-energy, highly nutritious, and filling foods that would last for long periods of time. Pemmican was light, compact, high in protein, carbohydrates, vitamins, and if done properly can last anywhere from a few years (decades) up to a lifetime without refrigeration! 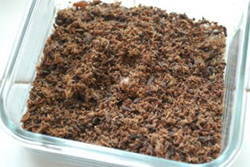 Pemmican consists of lean, dried meat which is crushed to a powder and mixed with hot, rendered fat. Back in those days, the natives made it with bison, deer, or elk but nowadays it is usually made with beef. Crushed, dried berries can be added as well. A man could subsist entirely on pemmican, drawing on the fat for energy, the protein for strength and vitamins for health. There are a few cases in history of people living for months in good health with only pemmican. So, it’s easy to understand why I choose pemmican as the ultimate survival-superfood. People really should avert their gaze from the modern survival thinking for just a bit and also look at how the guys who wandered the west 130 or so years ago did it. As I’ve said it in a recent article (30 Lost Ways of Survival from 1880) the “SHTF” we all prep for is what folks 150 years ago called “daily life:” No electrical power, no refrigerators, no Internet, no computers, no TV, no hyper-active law enforcement, no Safeway or Walmart. Get about a pound and a half of lean, grass-fed shoulder roast and let it firm up in the freezer so you can slice it thin. Add salt and pepper. Set the oven to the lowest possible temperature (around 150 degrees) and put the strips of meat directly onto the rack. Crack the oven door to prevent moisture buildup. 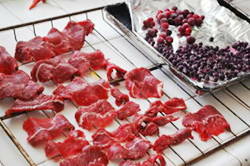 At this point, you can also put a handful of frozen wild blueberries on a small oven pan to dry out with the meat. Let the meat dry out for about fifteen hours, or until it is crispy. Toss it in the food processor until it becomes a powder. Do the same with the blueberries. In the old days, they’d pound it with a rock to turn it into a “powder”. For the fat portion of pemmican, you can use tallow (rendered beef or mutton fat) or lard (rendered pork fat). 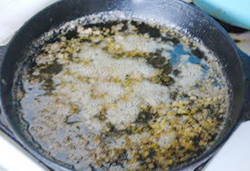 Cut up your fat into small pieces and place the fat into the crockpot. Set the crockpot on low heat and remove it only after it becomes completely liquid. Use a strainer to avoid all the crispy bits; you just want the pure, liquid fat. Mix the meat and berry powder together, then slowly add the hot liquid fat. Pour just enough so that the fat soaks into the powder – slowly. Let it firm up, then cut it into squares or roll it into a ball. 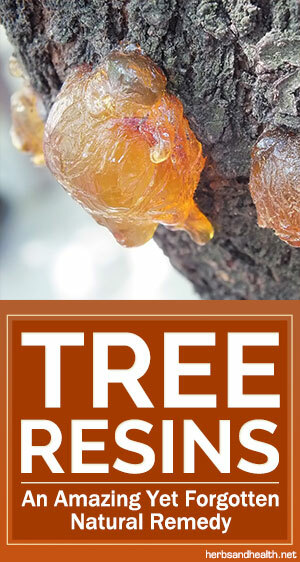 If done and stored correctly it can last for decades. Wrap these “pemmican balls” in wax paper and store them in a ziplock bag in a cool, dark place. Back in 1800, the native people Canada (Metis) would go southwest onto the prairie, slaughter buffalo, convert it into pemmican and carry it north to trade at the North West Company posts. For these people on the edge of the prairie, the pemmican trade was as important a source of trade goods as was the fur trade for the Indians further north. And this is because, for a serious journey, almost all foods would have been too heavy to carry. If you’ll ever have to bug out – especially without a car – keep this in mind: Pemmican is the most compact, light, natural and nutritious supply you can take with you.